Davie, FL, Police Sgt. Patricia Ravine nearly died 14 months ago when she was struck by a vehicle while assisting a motorist on the side of the road. Now she is back on duty at the department where she has worked 10 years and where her husband, Sgt. Shawn Ravine, also protects the public. "I've come to realize there will never be an explanation about why it happened," Ravine, 36, said. "All I can do is pick up and move forward." Ravine was on patrol during the midnight shift and stopped to help a driver in a rollover crash the night of Aug. 3, 2016, when a Kia mowed her down on the shoulder of Interstate 75, investigators said. Ravine endured a brain bleed, fractures to her neck, back, and hips and needed surgery to remove a piece of the Kia's windshield from her right foot, reports the Sun Sentinel. "To see her stand up again, to see her talk, it's amazing because it could have been so much worse," Shawn Ravine, a supervisor in the detective bureau, said in 2016 when his wife was released from a rehabilitation center. "It's a miracle and we have to thank God that she's here." "I cannot even begin to rationalize or understand how I overcame this whole thing," Ravine said. "I very much have a belief in the higher up. God had me that day." Thursday was Ravine's first day back at work, where she began a new administrative position supervising 15 officers who work in the public schools as well as at the campuses of Nova Southeastern University and Broward College. 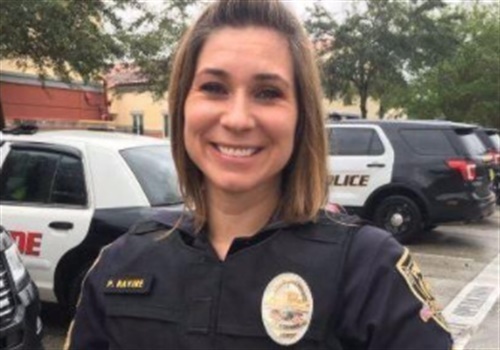 "We're just grateful to have her back," Davie Police Capt. Dale Engle said. "It's been a long struggle. I know that she has fought hard to get back to a position where she can work full time at the job that she loves. We're very grateful for the support from the community."